DVDs 24872 https://www.warplane.com/images/Products/24872.jpg THE ARROW tells the story of the passion, the betrayal and the players behind the building of the stunning fighter-interceptor jet constructed to defend Canada's vast territory during the Cold War. Cost over-runs, U.S. government intervention and Canadian political agendas grounded the Arrow before it had a fighting chance. A brash young team of designers at Avro Aircraft and their charismatic new president, Crawford Gordon (Dan Aykroyd) accept the RCAF challenge to create a radically advanced jet fighter-interceptor to defend Canada against powerful Soviet nuclear bombers capable of attacking over the North Pole. The Avro team races to break all performance records with the Arrow. But the dream begins to unravel in a dark and tragic tale of political ambition, international espionnage, subversion and deceit. SPECIAL FEATURES:There Never Was an Arrow: Running time 60 Minutes. 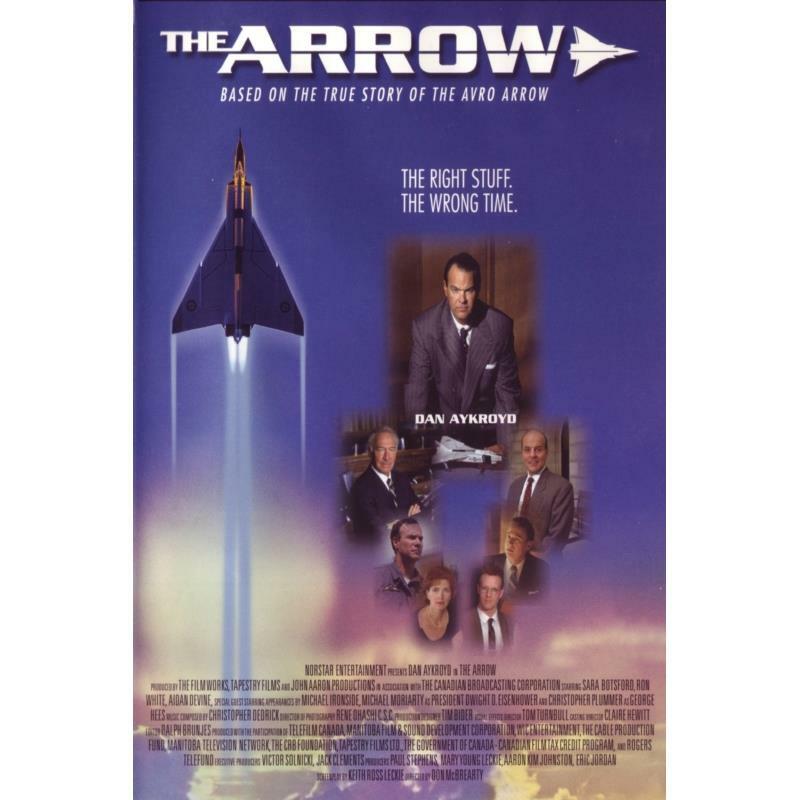 Meet the real engineers, politicians and military reps in The Arrow story in this remarkable 1975 documentary.The Legend of the Arrow: Running time 23 Minutes. Go behind the scenes of the film production and see how the cast, crew and special effects team recreated the Arrow with uncanny similarity.The Plane Truth: Running time 24 Minutes. An inventigation of the real story behind Canada's most famous aircraft that also explores the debate over its demise.Behind-the-scenes photo gallery.Magazine cover gallery.Dan Aykroyd interview.Web links. DVD-ROM Features:Contains a recreation of the original Arrow pilot training manual including specifications and drawings of the hydraulic system, flying control systems, electrical system and basic panel frame.Contains a recreation of the original 1953 Department of National Defense document listing the operational requirements of a new RCAF fighter-interceptor. Description: THE ARROW tells the story of the passion, the betrayal and the players behind the building of the stunning fighter-interceptor jet constructed to defend Canada's vast territory during the Cold War. Cost over-runs, U.S. government intervention and Canadian political agendas grounded the Arrow before it had a fighting chance. A brash young team of designers at Avro Aircraft and their charismatic new president, Crawford Gordon (Dan Aykroyd) accept the RCAF challenge to create a radically advanced jet fighter-interceptor to defend Canada against powerful Soviet nuclear bombers capable of attacking over the North Pole. The Avro team races to break all performance records with the Arrow. But the dream begins to unravel in a dark and tragic tale of political ambition, international espionnage, subversion and deceit. Additional Info: Runtime: 180 minutes. Colour.